PARK RIDGE, IL. – Christina Cynthia Antilla Depkon was born on November 19, 1963 and passed away on March 22, 2017 after a sudden illness. “A time to weep and a time to laugh, a time to mourn and a time to dance” (Ecclesiastes 3:4). With her beautiful smile, outgoing personality, and love of sparkle and color, Christy lit up the lives of all who knew her. She was full of life and laughter. She was both an entertaining storyteller and a compassionate listener, with a generous heart and bountiful cheer. She is survived by her husband of twenty-seven years, David Depkon of Park Ridge, IL, and their children, Katherine “Katie” Jean, Andrew Clarence and Mary Martha; her mother, LaVerne Antilla of Republic, MI; siblings, Dean, Carrie and Jon (Zoey) Antilla; her mother-in-law, Jean Depkon of Park Ridge; in-laws, Mary Stenbeck, Robin (Tom) Brenner, Patty (Rob) Hartwig and Jim (Susen) Depkon; along with multiple aunts, uncles, nieces and nephews. Christy was preceded in death by her father, Clarence Antilla. 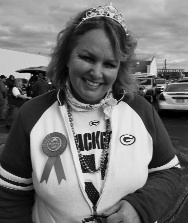 Christy believed in faith, family and the Green Bay Packers, though not always in that order on football Sundays. She graduated from Republic- Michigamme High School in 1981 and earned a degree in political science from Northern Michigan University. An internship at the Marquette Office of Congressman Bob Davis led to a position as Davis’ Legislative Assistant in Washington D.C., where she met her future husband. Christy and David were married on Mackinac Island, MI on August 5, 1989. Eventually they settled in Park Ridge where Christy was a full-time homemaker. She and Dave enjoyed hosting large Depkon Family celebrations and holiday parties. Christy loved watching Lifetime movies with Katie, cheering for Andy and Mary at their baseball and softball games, and sharing snuggles and squeezes with her loved ones, including Tiger, the family dog. Some of her favorite things included the Chicago Botanical Gardens, shopping and Starbucks with her daughters and Park Ridge friends, the Costco “lunch club” and spin class. She collected bling, birch bark and pine cones. She was a skilled photographer, particularly of the outdoors, and enjoyed many fall color tours around the Upper Peninsula of Michigan. Her quest to see a moose resulted in an up-close encounter on M-95, a few miles from the family’s hometown summer house, pine cone cabin, on the “Mighty” Michigamme River Basin. There, Christy and her family enjoyed swimming, kayaking and telling scary (or silly) stories by the bonfire. Christy was a long time attendee of an ecumenical bible study group and maintained her membership at Bethany Lutheran Church in Republic, while also attending Saint Paul of the Cross Church in Park Ridge. Two highlights of her life were the Packer Super Bowl wins. In 1997, Christy was with the raucous crowds in Green Bay, celebrating aboard a rocking Packer bus. In 2011, she cheered the team on with the U.P. “Bad Ones” crew. Christy’s best friends from her youth remained her best friends for life, from girls’ trips to Prince concerts, and especially Packer games. She was a proud owner of the Packers, and joked about showing up at the stockholder’s meeting with a briefcase and a plan for the next Super Bowl trophy. On her frequent trips North, she rarely passed Lambeau Field without stopping, on or off season. Christy was a joy to know. She will be greatly missed by family and friends across the country. “The Lord will give strength into His people; the Lord will bless His people with peace” PSALM 29:11 KJV. A memorial service for Christy will be held on Monday, March 27, 2017 at 2 p.m. at Bethany Lutheran Church in Republic, with Rev. Kevin Kaiser officiating. The family will greet relatives and friends from 12 p.m. until the time of the service. Memorials are preferred to the D.J. Jacobetti Home for Veterans Activity Fund, 425 Fisher St., Marquette, MI 49855 in Christy’s memory. The Canale & Pennock Funeral Service of Ishpeming is assisting the Depkon family where memories of Christy may be shared at canalefuneral.com.